Team Canada took the gold medal with a thrilling 3-2 overtime win over Sweden, making amends for a 4-3 loss to the Swedes in round-robin play. In the loss, Canada played its worst game in a long time. « If we had to lose, this was the time to do it. We were a little too confident. Unfortunately, the defeat came at great personal cost for me, » Bernier confided. The championship game was thrown into extra-time when Sweden tied the score with a very late third-period goal. Canada had led 2-0. 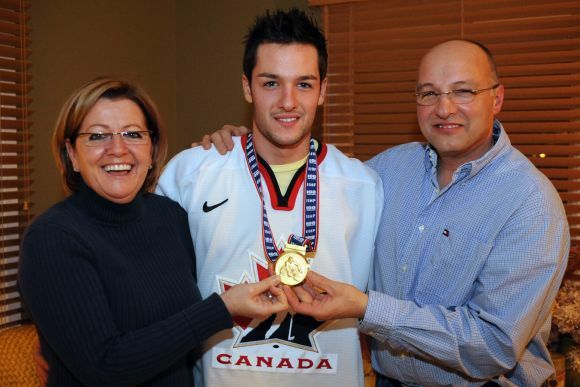 “I didn’t experience this gold medal with great emotion since I was sitting on the bench, but I feel I contributed to achieving it with my play in earlier games,” Bernier told Courrier Laval, adding that it was very important to bring the gold medal home to Canada. The conquest of the world juniors was Canada’s fourth in the last four years, matching the performance of earlier teams which also racked up four consecutive championships. No stranger to championships and medals at all levels of competition, Bernier, who started the season in nets for the Los Angeles Kings of the National Hockey League, and is presently on the roster of Lewiston of the Quebec Major Junior Hockey League, now adds another golden accomplishment to his many on-ice exploits.